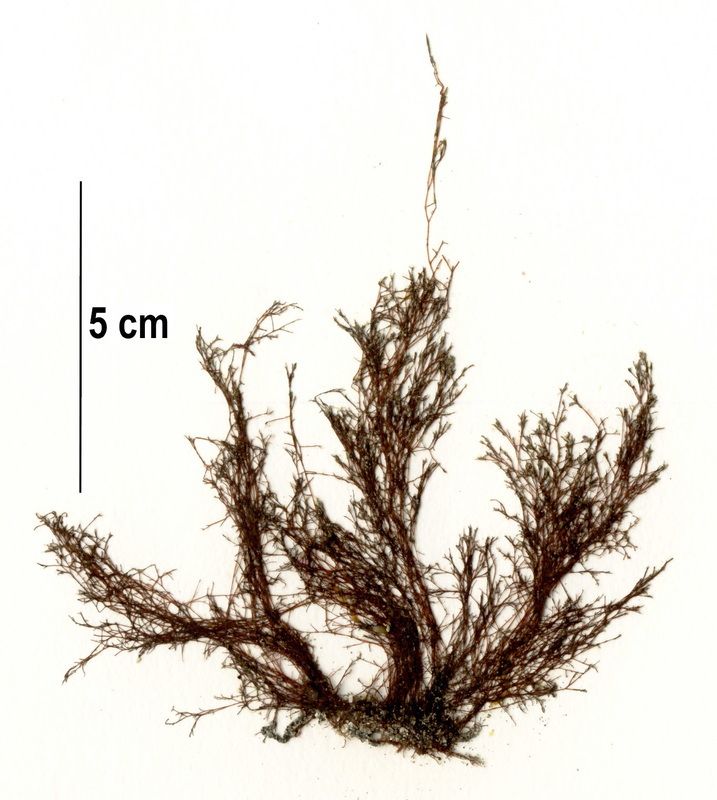 These specimens of P. senticulosa were found growing on boulders in the low intertidal and subtidal of semi-exposed and semi-sheltered shorelines on Calvert Island. These are specimen collection numbers PTM 410 (top left), PTM 438 (right), and SCL 15331 (bottom left) in the UBC Herbarium Algae Databse. Search the collection number in the database for more information on this specimen, or search the species for further occurrences. Image courtesy of Sandra Lindstrom. 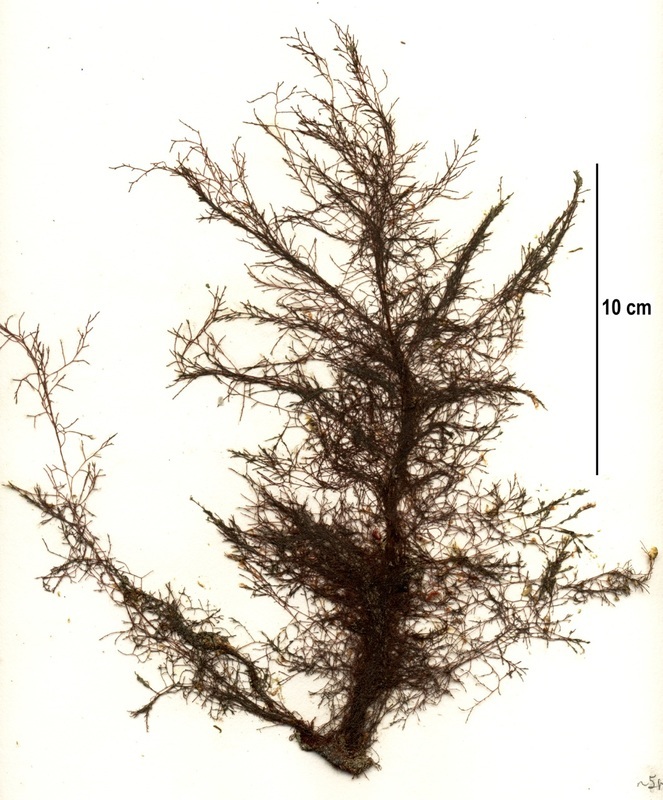 Polysiphonia species are finely-branched red algae reaching 25 cm long. Branches are thin (measuring less than 2 mm in diameter) and cylindrical. Branching is radial; when branches are spread out in water Polysiphonia species have a fluffy appearance. 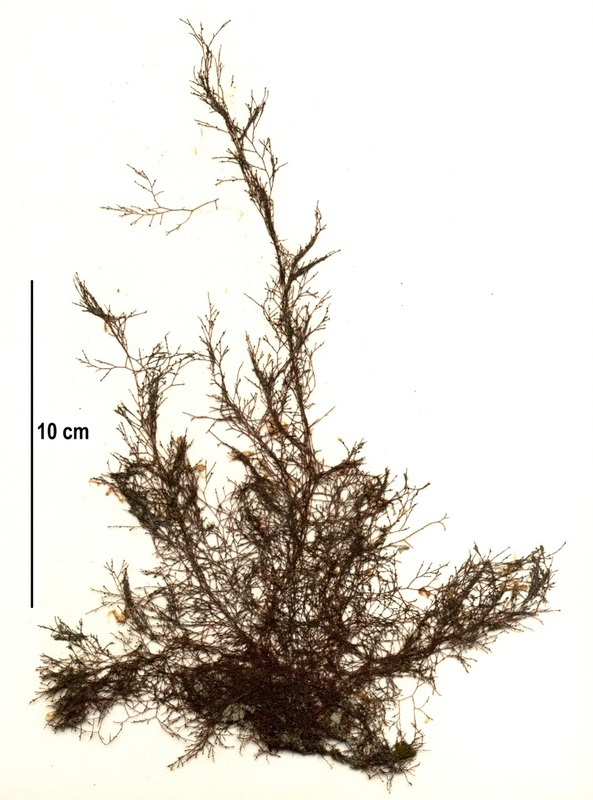 Polysiphonia species are differentiated from other finely-branched red seaweeds by a unique bundling arrangement of cell filaments; a microscope is required for accurate identification to the genus as well as species level. One helpful differentiating feature of P. senticulosa is the sharply pointed ends of some or all of its branches. The Pacific Northwest range of P. senticulosa extends from the Kodiak Archipelago to northern Washington. It has also been reported along coastlines of the Netherlands, Australia, New Zealand, China, Japan, and Korea. Druehl, L. (2000). Pacific Seaweeds: A guide to common seaweeds of the west coast. Harbour Publishing: Madeira Park, BC, Canada. P. 107. Lindberg, M. and Lindstrom, S. (2010). Polysiphonia senticulosa. Seaweeds of Alaska. Accessed 06/07/2015.